St. Mary's Church: 5. History of St. Mary's School. 5. The History of St. Mary’s School. Some important dates on the Timeline of St. Mary’s School. 1870: The first beginnings of St. Mary’s Parish and School when the Passionist Order comes to Harborne and purchases a disused Methodist Chapel in Heath Street, now High Street. 1871: A schoolroom is erected at the rear of the Chapel and Mrs. K. Rigby becomes the FIRST Catholic teacher in Harborne. 1873: The purchase of “Harborne Lodge”, now The Priory, in Lodge Road, now Vivian Road. The Passionists now have a Monastery or Retreat. 1874: The old Chapel House in Heath Street is now turned into a school and the Conservatory at the rear of Harborne Lodge was used as a temporary Chapel for Mass to be celebrated. The Conservatory is behind this fence today. One of the two new classrooms can be seen at the extreme left of this picture of the new St. Mary’s Church. 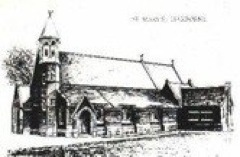 1877: February 6th saw the opening of the new St. Mary’s Church. The Foundation Stone is in the present school today. 1899: The lady on the extreme left of this group photograph had been appointed as the School’s second Headmistress, Miss Madge Nolan. The lady on the extreme right is Mrs. Donnelly though little is known of her at this time. 1905: This charming photograph of a school class was taken in the top playground behind the wall that joined the school to the Church. The doorway was later changed to a more oblong shape. 1926: Miss M. McHugh becomes the school’s third Headteacher. 1935: Mr. W. J. Griffin becomes the fourth Headteacher. Photo © Birmingham Central Library. 1936: Two new infant Classrooms are added with a Lower Playground, though this playground is now the Priory Car Park. The corridor extension at the front was added much later. 1954: The Ministry of Education grants St. Mary’s School “Aided” status. 1955: A new school block is built at the bottom of “The Drive” at the left side of the Church containing classrooms, a School Hall, Headteacher’s Office, Staffroom, Kitchen and Toilets. At the back of the Hall remained “The Field” where the Parish Boy Scouts often camped out during school holidays. This panoramic view, taken from the rear playground, (formerly “The Field)” shows The Priory on the extreme left, school buildings (1955), and new classrooms built in 1963 on the right. 1963: In “The Field” behind the school three new classrooms are opened, including a medical Room, storerooms, and additional toilets. 1968: Mr. L. L. Boden becomes the school’s fifth Headteacher. 1971: To celebrate the Centenary of the opening of the first schoolroom in Harborne High Street a new Entrance Foyer is added to the front of the school and it was Blessed and opened by Fr. Hubert CP. on 16th January 1971. 1986: Mrs. Fitzpatrick is appointed as the sixth Headteacher. 1989: In March the sudden death occurred of Miss Edith Lloyd who had been on the school staff for many, many years. She had also been the Deputy Head for 33 years. 2001: Miss Helena Cusack was appointed as the seventh Headteacher. 2008: More improvements to the playground included a covered area beside the last classroom. 2009: More improvements to the Entrance included a ramp and safety railings. 2011: The beginning of the school year saw the building of a second storey above the School, with years 2 to 6 being taught in these Mobile Classrooms for the duration until July 2012. 2012: The new second storey to the school is opened, also the new playground access for cars and emergency vehicles. A new access road was also built to the rear playground, for Parish car-parking at weekends, between the Priory and the rear of the school hall. 2016: An Astroturf pitch was built on what remained of “The Field”.